Does anybody know what the difference between the 'Original' rosters and the 'Current' rosters is? And where each is saved in the game folder? I only see one set of database files in the game folder. 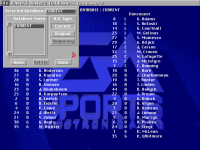 Original rosters and other info are saved on NHL95 root on ".ORG"-files. 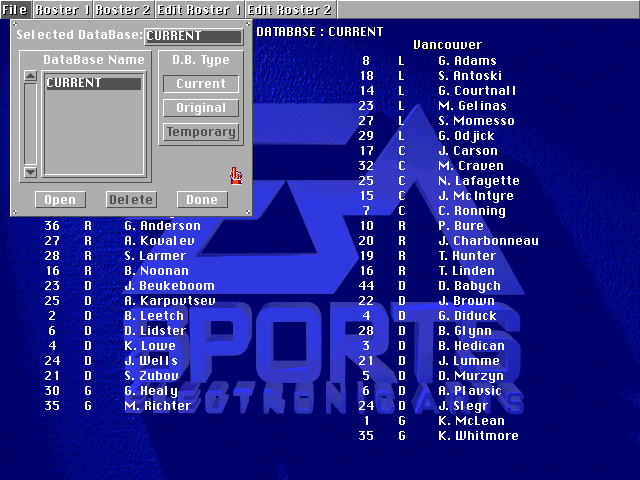 If you make changes to current rosters, those changes are saved on ".DB"-files on NHL95 root. In game you can select in some cases which ones do you want to use, for example at that roster viewing/editing or when you are starting new season. Season databases will be located directory with season name. If you choose for season name as myseason, game makes "myseason.lp" directory for that season database. Database files on that directory are ".DB"-files. Okay that makes sense. I assume that the *.org files have the same format as their *.db counterparts. So if I wanted the original rosters to be custom I could make changes to the 'current' rosters by editing the *.db files (say with your import/export roster tools) and save the *.db files over the *.org files by changing the file extension? I suppose so it would work like that, but why would you like to touch on originals? I guess I'm concerned about loading up the original rosters in the game and that 'accidentally' saving them over the current rosters which would erase any work I have done. But I suppose that could be solved by making backup copies of the roster files themselves. Yes. My issue occurred not when starting a new season but when I was in the central registry I accidentally overwrote my current rosters (which had a bunch of changed team names) with the original rosters. I hadn't made a back-up of the current rosters so all of the work was lost. NHLinfo is also very handy tool to make new players, edit them and transfer them to other teams. Yes I plan on using that once I finish making all of the graphical changes. Does NHLInfo allow you to add roster slots to teams that don't have enough slots to accommodate the custom roster? Each team can hold max. 25 players and 3 goalies. You can insert new players or goalies to that point, after that new player/goalie will be created as free agent. This is a very helpful thread. Do we know how big the free agent list can get?